The magical allure of 3D is stronger than ever but manufacturers struggle to meet the demand for better and cheaper ways of 3D capture and viewing. And while glasses may feel alright in the cinema, wearing them to watch TV is perhaps too much to ask of the general public. In the 3D dawn, users are already waiting for a revolution. Surely, there are many reasons why the goggle-free 3DTVs can’t enter our homes yet, but we're lucky to have a piece of that magic in our pocket. And while the other manufacturers are still mulling it over, LG is taking the lead. 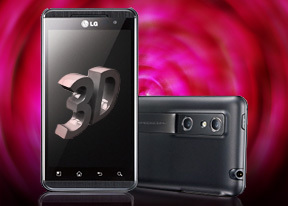 The first ever mobile phone with a 3D display - the LG Optimus 3D - was announced back in February at the MWC and is now available. In one swift stroke, LG caught the competition off guard. It seems the Optimus 3D holds all the cards right now. There is barely a phone that can compete succesfully on all levels. Although the screen and pair of cameras are the key features, it has everything to become a bestseller even without the 3D trickery. Starting with the dual-core processor and latest-gen graphics, through the capable camera and connectivity package, and the snappy Android Froyo (hopefully, soon to be replaced with Gingerbread). No more teasing, here is the full feature list. LG Optimus 3D is far from perfect, but there is no such device out there anyway. The thing of utmost importance here, beside the Optimus 3D being the first of its kind, is that it does an excellent job at it right away. You know most tech pioneering gadgets are nice concepts but rarely turn out polished enough to make a difference. Well, the Optimus 3D is no tech demo. It works as it is supposed to – there are the 3D menus, the 3D gallery, the 3D pictures and videos and finally, real 3D games. And the best part is that they look awesome. Surely, there are a few things that might turn out deal breakers for some, but hey, nobody's perfect. If you can forgive the lack of a few features and you're willing to wait until October for the Gingerbread to fix the few performance issues - you should know it will be worth it. Now let's cut to the chase. Our hardware tour awaits right after the jump. Lg is very heavy than the other mobiles, i bought it 8 days before but now it does not work properly, i dont know why this company produce such things. i wish that they had gotten our means.